John, Paul, Ringo and George. This fab four known as The Beatles were responsible in the swinging sixties for one of the most definitive albums of all time, ‘Sergeant Peppers Lonely Hearts Club Band’. However there is one person we have to thank (apart from his ex-wife) for that glorious iconic cover art with the 70 cardboard cut-outs of the band’s famous heroes including Bob Dylan and Marilyn Monroe; that person is artist, Sir Peter Blake. 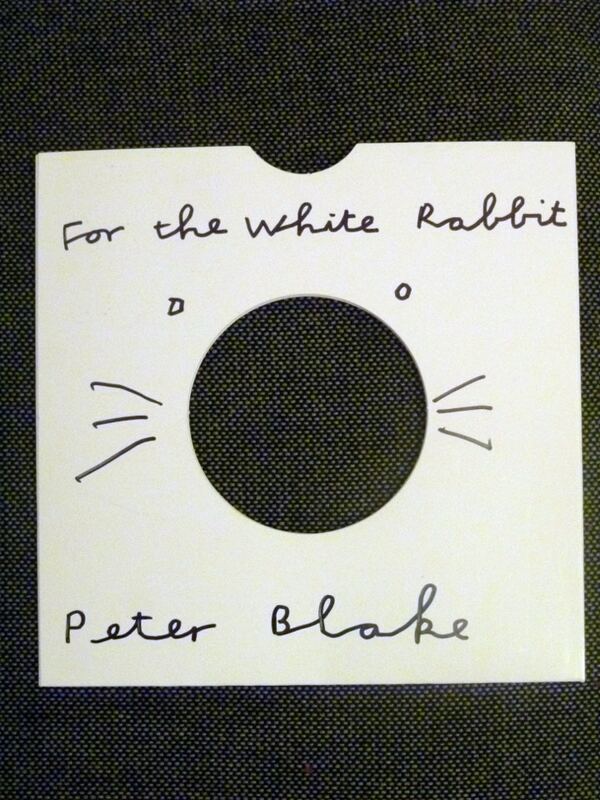 Dubbed ‘The Godfather of Pop Art’, Blake (b.1932) has been at the forefront of British popular culture for decades. Renowned not only for his commercial work with The Beatles, Paul Wellar and Oasis but for famous paintings such as ‘On the Balcony’ (1955-7) and ‘Self Portrait with Badges’ (1961 on display at Tate Britain) plus silkscreen prints, woodcuts, etchings, graphics and collages. 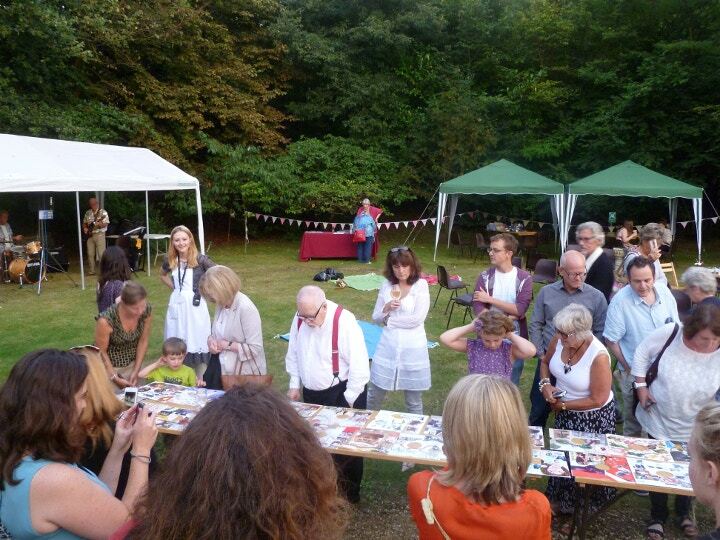 It was an exciting treat then for the villagers of Guildford on 25th July when Blake decided to pay the Watts Gallery a visit for their special evening event ‘Watts at Dusk’. The gallery is currently holding a commercial solo exhibition of Blake’s work, titled ‘Pop Victoriana’ that includes a selection of work from the rare ‘Through The Looking Glass’ print series of 1970, the album artwork for Band Aid (2005) and more recent ‘found art pieces’ such as ‘To a Daring Child’ (2013). Blake started off the evening with his sold out lecture that exceeded gallery goers expectations as he presented a fun but factual account of his childhood, career and influences before tackling everyone’s questions afterwards. Did you know he originally coined the phrase ‘Pop Art’? That he fantasised about being an Abstract Expressionist and wants to make more paintings in this style in the future? And Blake’s favourite medium is actually watercolour! Surrounded by idyllic British countryside and a warm summer’s breeze, the lawn outside the Main Gallery’s entrance then played host to the rest of the evening’s activities. Staff went to great lengths to incorporate both an Alice in Wonderland theme as well as Blake’s love of everything quintessentially British. A live jazz band performed for the artist while both children and adults played croquet, tucked into a summer barbeque sat at picnic tables - and the bar served summer’s favourite tipple, Pimms! Playing card garlands were scattered about and two members of staff were dressed as Alice and The White Rabbit to greet the children. Even Blake’s Pop Art double decker bus was on site for visitors to explore inside. The ‘Collage a Record Cover’ activity, however, proved to be the most popular pastime. Everyone frantically set about collaging blank 7inch or 12inch record sleeves at the picnic tables while Blake sat amongst everyone enjoying the music, food and conversation with the villagers. The night drew to a close when Blake judged the winning record sleeve, awarding one lucky lady a copy of his art book ‘One Man Show’ by Marco Livingstone. Some were even lucky enough to get an autograph from this talented octogenarian. I was lucky enough to get special treatment after all the chuckles I had received from my appearance by the artist himself. I think you can guess why from my signed record sleeve! Blake’s ‘Pop Victoriana’ exhibition is running until the 31st August at the Watts Gallery.